Anyone use these on their 7+? Wondered if they help or if it's a gimmick. I have tiny girl hands and would like a 7+ but can't figure out a secure way to hold it. I use mine religiously. Also have tiny girl hands. Best $10 I have spent on a phone. olliegrl and SABRIAN70 like this. Do they actually stay? What are the tops made of? Paper? When they're pushed in, is the phone relatively flat? You can view comments from readers who’ve used them via the following iMore Forum link. I don’t use them myself but I know lots of people who do. From what I see they stay in place really well. They’re made of a rubbery substance in the middle with either a plastic or metal finish on top. I have quite a few of them & the adhesive is VERY STRONG ! They certainly help in holding the 6S plus ALOT.... I'm also petite (4-11). I actually have a few cases set up with one so when I change cases it's convenient. As far as using them on life proof fre cases, if you don't have a skin for the case its hard for the PopSocket to stick because of the textured surface of the LifeProof fre. Also, I don't use them on any of my Apple leather cases, as strong as the adhesive is if it needs to be removed I wouldn't want to damage the leather on the cases itself. 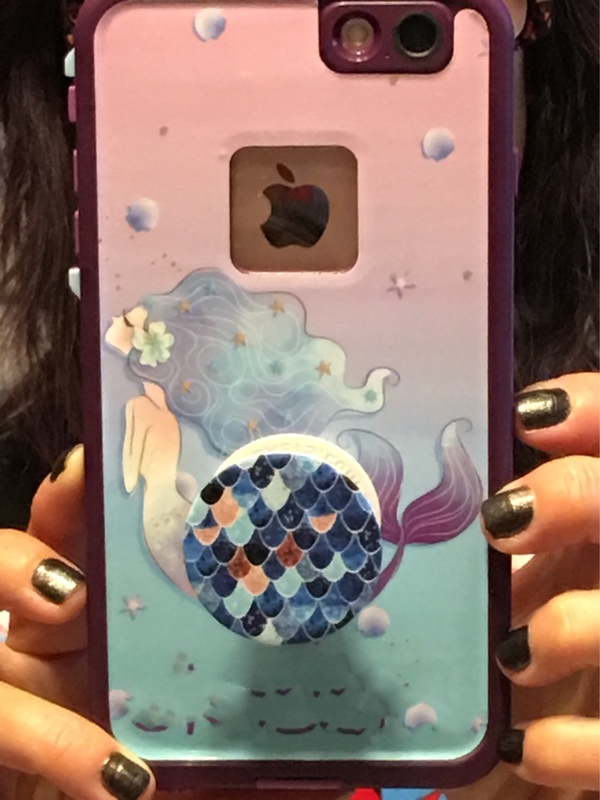 Here is one of my fre's set up with a custom Skin from SkinIt.com and the mermaid PopSocket. So I highly recommend them honestly. olliegrl and libra89 like this. It’s a gimmick, as far as I’m concerned. I also have tiny girl hands and found out that holding my 7 Plus with both hands is a secure enough way to hold it! LOL..... Yeah they're not for everyone. I use mine on my 6s, and I love it! Since it works so well on the smaller 6s, I can imagine that I'll love it even more if I go for the 7s Plus. Now that I have one and like it so much, I can't imagine getting a larger phone and not having one. I bought an original Popsocket, and those can be removed and repositioned without compromising the sticky stuff. I also bought a few Popsocket knock-offs from a kiosk at the mall and those work exactly the same as an official Popsocket. In fact, I think the knock-off one is better because the image is on the plastic round piece, whereas the original Popsocket feels more like a paper image stuck to the plastic. My original one shows quite a bit of wear in the short time I used it whereas the image on the knock-off hasn't shown any wear at all. Here's a few of my PS and cases with some attached. 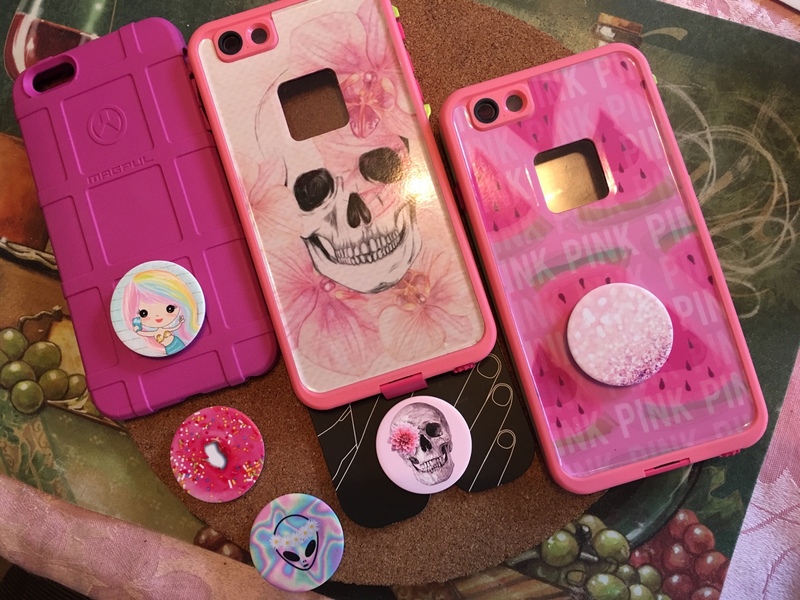 I just received my skull PopSocket today to go with my pink fre custom Skin It skin. Wow! Very nice! I wish I had the patience to "accessorize"
I'm really trying to just buy one good case and be done. So when I found out about PopSockets I wanted to make sure if I bought one I'd have it for a while. I don't always use it (though it's always connected) but I do find it really helps keep the phone manageable and mine's a 6s. I'll definitely be putting one on my Plus, or whatever it's called, on the next phone. I love pop sockets so much I bought two - one for my battery case (it makes my 6S plus heavy so the pop socket gives me a more secure hold) and one for my other cases. They come off using a credit card to pry them off and stick back on the next case securely. Just press around the base well. My favourite use is for taking photos as the pop aocket helps to stabilize the phone in my hand. Where did you get those lovely cases from?? I haven't been drawn to try one out but I see lots of them in the wild. The pink one on the far left is a Magpul Field case from Amazon, and the other 2 are LifeProof Fre cases from Best Buy, with a custom skin sticker from SkinIt.com. Have you experienced the Quick reply pop-up going away for no apparent reason while replying? These 11 Graduation Photo Props are sure to make your grad photos POP! Anyone use a Logitech Pop?